Now I don’t want you to get the wrong impression that my kids watch a lot of TV. They don’t. I don’t even have DVD players in the car ( that will be a post for another time), but they do watch some TV. Our family is truly blessed – we have a roof over our heads, we have food to put on our table and live in a wonderful community with good schools. How do I make my girls appreciate what they have and give back to others who may not be as fortunate as they are? 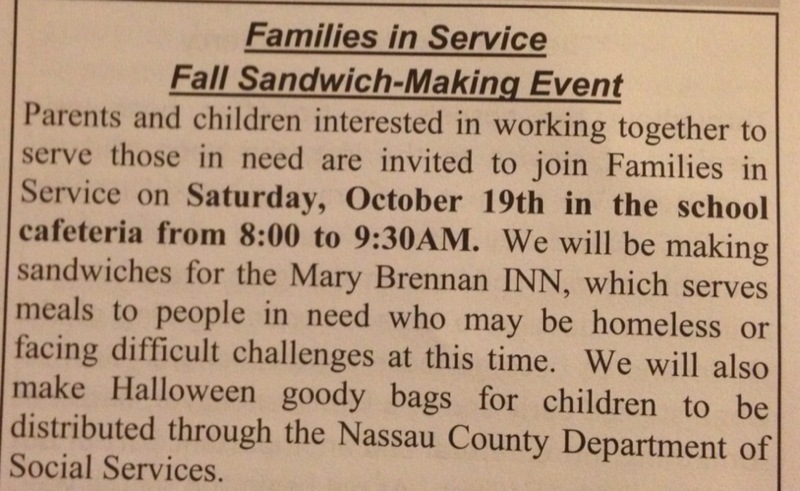 Our church sponsors this local sandwich-making event for a shelter which serves meals to people in need who may be homeless or facing difficult challenges and need a helping hand. We are going to make sandwiches and bags of Halloween candy this weekend – the girls have done it before and absolutely loved it. It is a great way to teach children the gift of service! I am sure if you look around, you will find an opportunity for your kids to give back to the community – fall and winter coat drives, weekly food drives, etc.